Sulzer Mixpac has announced the launch of Mixpeel™ , a revolutionary and reliable adhesive packaging and dispensing solution that fits two components in a one-component style cartridge. Customers can benefit from the ease of use, improved filling procedure, additional fill volume, reduced waste volume, and enhanced performance. Sulzer Mixpac, the world’s leading manufacturer of two-component material packaging, mixing and handheld dispensing systems has leveraged more than 10 years of experience in peeler technology to deliver Mixpeel. The system features the company’s latest 2-in-1 concept particularly for the construction sector. It can be used for a wide variety of applications such as chemical anchoring, 2-component sealing, crack repair etc. Mixpeel presents a number of innovative features that improve overall performance and product reliability. 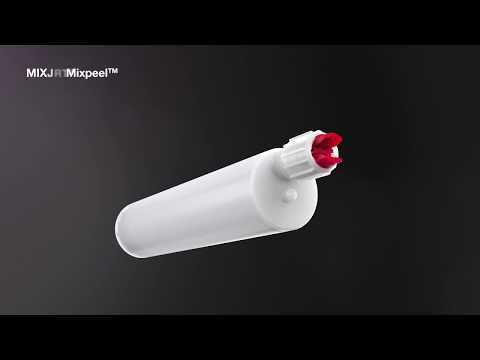 Mixpeel provides key benefits to fillers as well as adhesive manufacturers. The new design enables both, to more easily and quickly fill the cartridge from either the nose or the backend. For nose filling, pistons come pre-inserted which streamlines the process. When it comes to the new 280ml fill volume, Mixpeel provides additional capacity versus competitive products in the market. Finally, yet importantly, the retained waste volume is much lower, compared to other products, which provides environmental benefits. Sulzer Mixpac offers its 1:1 280mL Mixpeel system with a wide range of onecomponent dispensers offered from the COX™ and MK™ range. The Mixpeel package combined with the dispenser as well as the Sulzer Mixpac mixer portfolio allows the users to benefit from a proven system that is wholly engineered by Sulzer Mixpac to provide superior quality and optimal mixing performance for their applications. Roman Thönig, Global Head Business Segment Adhesives based at Sulzer Mixpac in Haag, Switzerland, commented: "With the new Mixpeel packaging system, Sulzer has addressed and subsequently realized a number of key elements in order to provide fillers, adhesives manufacturers and most importantly end-users a superior solution covering actual market requirements such as easier filling as well as an improved economical footprint due to higher fill volume and minimized waste. Moreover, the well-known and proven 2-in-1 package design means having a two-component adhesive packed in a one-component cartridge style allowing the usage of a one-component dispenser, which is of paramount importance, and a huge advantage, when it comes to choosing a cost efficient and lightweight dispensing method."